Director of Coaching Guillermo “Memo” Medina earned his U.S. Soccer Federation National “A” license. This is the highest license available in youth soccer. Temporary lighting project designed, developed and installed by volunteers and supported by donations from community leaders and companies. There is a lot to be proud of, and a lot of exciting soccer ahead of us. Our South Bay AYSO recreational program is as strong as ever, and will continue to feed top talent and coaches into our competitive Matrix soccer side of the house. Our motto for the new year is adapted from the teachings of the great John Wooden: Full Preparation + Full Effort. Here is to unlocking each player’s full potential in 2016, each child’s potential. We look forward to another year of outstanding player and coach growth and development! U14G Matrix Elite: Still Tough to Beat! 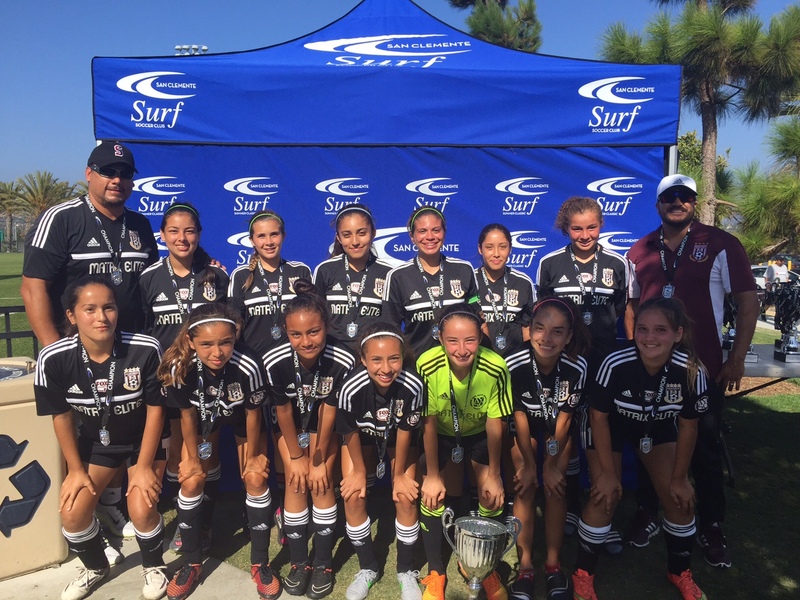 South Bay AYSO’s GU14 Matrix Elite team fought to the end in each match this weekend in capturing the San Clemente Surf Summer Classic. The South Bay girls finished first in bracket play with two 1-0 matches. Then in the Semi-Final, they won 2-1 so set up a showdown in the final versus Inland Empire Surf. The Matrix Elite squad won in PKs 3-2, defeating an IE Surf team ranked 31st in the State. Matrix Elite also defeated IE Surf during last spring’s State Cup competition. South Bay’s Matrix Elite team has won consecutive tournaments, part of the team’s preparation for the Fall 2015 San Diego Development Academy season that begins September 12. The teamwork has only increased in recent matches, even as the team has played with a target on its back considering the girls reached the finals of last year’s prestigious State Cup. Coach Polo Aviles said he could not be more proud of his 14 players—a committed and dedicated squad. From start to finish, the U13G South Bay Matrix Elite team put together the greatest competitive soccer season in the history of South Bay AYSO. The ‘Dream Season’ of 2014-15 finally came to an end for our U13G team at the US Youth Soccer Regionals. Our girls dropped a tough one to Idaho Rush Premiere, 3-2, on Friday, June 12 in the state of Washington. We are proud of this team. It earned a host of tournament finals and championships last summer, including the defeat of last year’s Nevada State Cup champion on Labor Day Weekend. The team followed that up with a first place finish in the San Diego Development Academy, and had a great run in making the finals of the State Cup in Cal South. Team officials were understandably disappointed at not advancing to the knockout round of the US Youth Soccer Region IV President’s Cup this week. Their bracket included FC Warriors Blue, which was again the Nevada state represenative, CalNorth Manteca Rangers, and Idaho Rush Premiere. The 4-0 victory over Manteca was the highlight. The overall experience had to have been incredible for the players, parents and coaches. While there is disappointment in today’s loss, there is also great hope for the future of this hard-working group of young ladies. Way to go South Bay! It gives our AYSO Matrix program great pleasure to announce that Arely Salcedo and Denise Castro of our very own South Bay Matrix Elite GU13 squad have been selected for the San Diego Developmental Academy Select Team. These yo ung ladies will be representing our club proudly and will participate in Showcase events, where they will have a chance to get scouted for the Cal South Pro+ program (ODP). In all, five players were nominated from our SB team. In photo, from left to right: Alyssa Dasis, Savannah DeLara, Daniella Ibanez, Denise Castro & Arely Salcedo. The girls appear to be peaking at the right time. Coach Aviles and Coach Gustavo Padilla are looking forward to the squad’s upcoming showcase weekend in the San Diego Development Academy. Congrats to the team, and keep up the hard work. The SDDA season is just around the corner. Getting to the finals could be a habit for this team. Father-daughter moment: smiles all around. The SDDA season awaits. How far can this team go? Matrix South Bay U13G and U10G teams were up to the challenge, as each team took the championship title in their respective divisions in the United Summer Challenge on Aug. 2-3. The U13G rolled through bracket play in the highly competitive Black division of the tournament, held at locations throughout San Diego. The South Bay team defeated Poway Vaqueros 3-0 in the semis, and Encinitas Express 3-1 in the championship match. In four matches overall, the South Bay squad recorded 12 goals, with only two allowed. Coaches Polo Aviles and Gustavo Padilla are looking forward to this fall’s San Diego Development Academy Flight 2 season. The girls have defeated Flight 1 teams this summer, and will continue to practice hard in preparation for academy season. In U10G, the girls coached by Manny Trujillo reached yet another final, and won this one in dominant fashion 5-2 over TVSA Hawks. This young squad continues to improve with each tournament. Congrats to each of our South Bay teams! South Bay’s littlest ladies and its most experienced girls soccer players each dominated the competition in the recent Goya Cup. The South Bay Cowgirls, coached by Christian Valderrama, continue to grow in their skills and footwork by the week. This U7 team is really too young to measure by victories or goals scored. So we will celebrate their obvious joy of playing, and the advanced skills they already demonstrate. Great job, Coach Christian and our Cowgirls! In U16G, Coach Hector Romo’s Matrix Elite squad kept rival Nado scoreless in both bracket play and the championship match. Matrix Elite defeated Nado 2-0 in the Goya Cup championship on Sunday, June 1. The girls dominated play from the opening whistle, and in all facets of the game. Nado and Matrix Elite will face each other in the Fall 2014 San Diego Development Academy league, where each plays in Flight 1–the highest level in San Diego County. 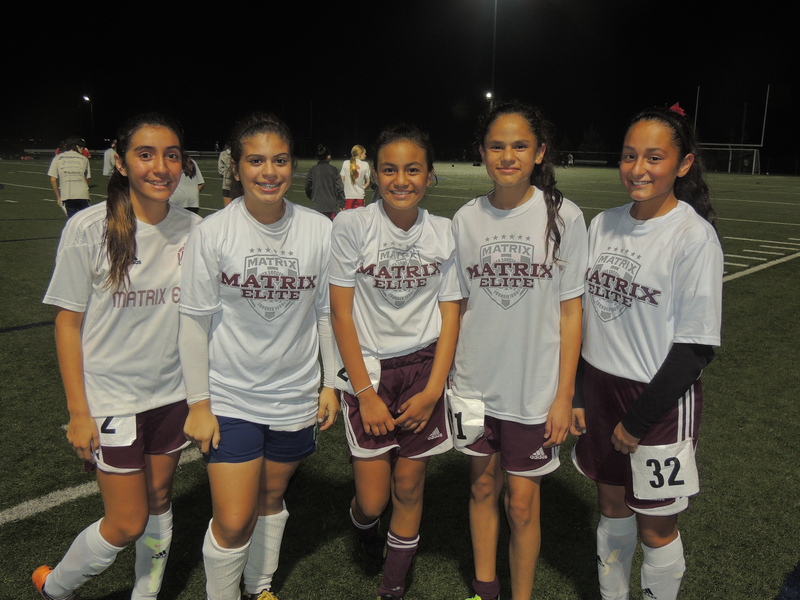 Matrix Elite is composed of girls from both South Bay and Bonita AYSO. It is a deep, talented squad. The majority of the players have been in AYSO for their entire youth soccer experience. They have proven that it is not the logo on the jersey that makes the players. It is not the brand of the jersey, the amount of coaching fees the parents pay, or the smoke blown by rival clubs of ‘college’ exposure that makes the players. It is the coach that makes the players, who puts them in a position to succeed, to maximize their training and hard work. While our program in South Bay AYSO/South Bay Matrix is still a work in progress, Coach Christian and Coach Hector are the latest in a long line of outstanding South Bay coaches. We celebrate the passion for the game that each coach has instilled in their players. Way to go!